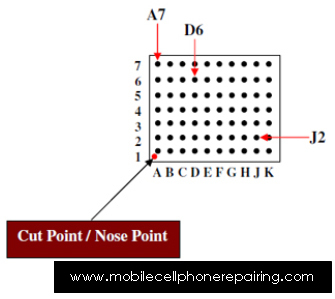 Any mobile phone PCB has several IC or Integrated Circuit. These are SMD or Surface Mount Electronic Components. Before Counting Legs or Pins of IC or understanding how to count legs or pins of any IC, let us learn about IC. An IC or Chip is an electronic component made up of combination or integration of several other electronic components like resistor, capacitor, coil, diode, transistor etc. How Many Types of IC are There? Leg-Type IC: This type of IC or SMD Components have legs or pins or leads. These types of ICs are again divided into different categories but we will not discuss it here because it has nothing to do with mobile repairing. Ball-Type IC: This type of IC has BGA (Ball Grid Array) underneath the IC. These types of ICs are again divided into different categories but we will not discuss it here because it has nothing to do with mobile repairing. How to Count Legs or Pins of Leg-Type IC? Counting of leg-type IC starts in Numerical Digit in Anticlockwise Direction starting from the Nose Point or Cut Point. Have a look at the photo below to understand it clearly. How to Count Balls of Ball-Type IC? Counting of Ball-type IC is done in Both Clockwise and Anti-Clockwise Direction. Rows are counted in Digit Numbers (1, 2, 3, 4…) in Clockwise Direction. Columns are counted in Alphabet (A, B, C, D…) in Anti-Clockwise Direction. NOTE: When counting Columns, “I” and “O” are omitted because they look like “1” and “0”. This article was aimed at understanding different types of IC and IC Pin Identification or how to read IC Pin Details. The main idea behind counting pins on IC, is to identify Pin No 1 on an IC. If you understood how to identify Pin Number 1 of a IC, you can read all the rest. I hope you found this article on Counting Legs or Pins of IC useful. Do share your thoughts below. Thanks! What l have gained from your posts l cannot tell it all as a beginer but to thank GOD and you and also to pray to GOD to give you all Resources you want and deserve from GOD. Please note that presently lam on Theory and not on Practical yet. But Searching for where to receive Practical training. repair and laptop pc repair. I will be earnestly waiting for your response. sir,really your site is very neat and clear.very interesting and use full .please keep in updating. Am really grateful for this man. plz upload audio ic & mic ic & power ic & network ic images this site most usefull for begginers & thank u for these mobile repairing tutorials. This is really helpful for advance users as well as beginners, doing great job at all. keep it continue…. pls thank u,may God bless u.but pls send me more abut hardware problems and solution.